About the Breed: The Norwich Terriers are the cutest dogs ever and they totally love kids! They are very social and fun loving, and not aggressive at all. 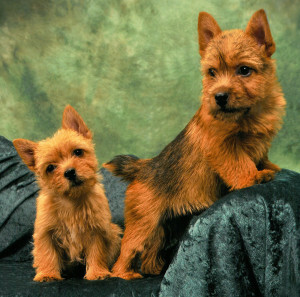 Norwich Terriers are bred for hunting varmints, mice, rats, etc., and they are really devoted companion dogs. They love to play fetch, have their belly rubbed, and enjoy children. They are pack dogs and do not fight unless forced into a fight. Norwich Terriers have the same typical health problems as most dog breeds, however our line is as genetically clean as we can make it. They should live long healthy lives.